It turns out Calais refugees are quite art savvy. A few days after the world-famous street artist Banksy created his latest work at the notorious 'Jungle' camp, refugees assumed the graffiti was there to help them earn a living, and have even gone as far as charging RT to view the artwork. 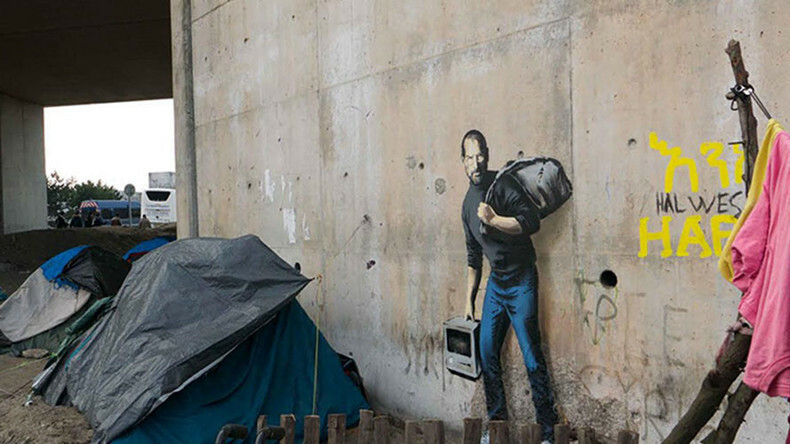 Here’s how it worked: Steve Jobs was a child of migrants, Banksy put Steve Jobs on the wall, depicting him as a refugee. Sounds great, but will you be able to see the graffiti easily? When an RT crew approached the wall, refugees quickly covered the graffiti with a cloth. “We are guarding this area,” they told RT’s Polly Boyko. “Guys, you don’t own this. I’m a journalist, and it’s my job,” the reporter said. Would you care to guess the refugees’ answer? The starting price was €20 (US$22), and the final cost dropped to €7. Days ago, the French authorities pledged to preserve the graffiti by installing shield glass or transparent plastic panels. However, it seems the asylum seekers are tackling the issue on their own just as well. 'Wolves of Middle East'. Based on true story. This latest episode adds to an already-chaotic situation which sees asylum seekers attacking UK-bound trucks on a daily basis. UK Immigration Minister James Brokenshire has announced that a special ‘secure zone’ for the drivers is being created to deal with the assaults. Representatives of logistics companies have expressed their anger over the issue: for example, Richard Burnett, chief executive of the Road Haulage Association, said that action is needed immediately. "Migrants are throwing boulders, bricks, even a 10-foot spear from a bridge which went through a cab window. There's a massive risk a driver is going to get killed. The problem is not being contained," he said, as quoted by Express media outlet.